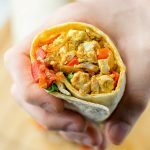 This Vegan Breakfast Burrito with Tofu Scramble is the only recipe you will need to make a healthy breakfast in under 20 minutes. It is the best burrito filled with tofu, mushrooms, and bell pepper and is kid and family friendly. It’s naturally vegan, gluten free and so delicious for everyone. Heat a skillet with a bit of oil or with vegetable broth, if you don’t use any oil. Add onions, optional mushrooms and bell pepper, and fry all for around 4 minutes. Scramble the tofu with your hands and transfer to the pan, add kala namak and cumin. This is also the time for the optional spices such as paprika, chili, and for a more bold cheesy flavor nutritional yeast. Add some halved cherry tomatoes right now, as well. Season all with a pinch of salt and pepper. Cook the mix for 4 minutes more. While doing this, warm your tortillas. Now assemble your breakfast burrito. Place about 4 Tbs of the filling in the middle of the tortilla. Add some optional salsa to it and fold them.